As the retired president of SEIU, the largest union of state workers in this country, and member of President Obama’s Fiscal Commission, I am watching with the rest of America the multiple dramas unfolding in Wisconsin: the disappearing act of Wisconsin’s Senate Democrats, cable TV’s recurring Egyptian analogies, the early hyperbolic threat by Gov. Scott Walker to call out the National Guard, and now full-throated demands of the right-wing media to fire teachers, nurses, and firefighters. It is not easy, amid the competing claims, for a reasonable citizen to grasp the facts underlying the alleged cause of the conflict—the state of Wisconsin’s budget and pension-fund problems. According to the centre for Budget and Policy Priorities, and most fair observers, Wisconsin, like 44 other states, has a budget problem. Wisconsin’s projected budget deficit for fiscal year 2012 is $1.8 billion, or 12.8 per cent of the state’s total budget. A problem, absolutely, but a small one compared to the leading deficit distressed states: Nevada at 45.2 per cent ( $1.5 billion); Illinois at 44.9 per cent ($15.0 billion); New Jersey at 37.4 per cent ($10.5 billion), and Texas at 31.5 per cent ($13.4 billion). David A. Graham: When Politicians Run AwayPublic workers, elected officials, unions, or others whom one might want to blame did not create today’s fiscal crisis. An already weak and increasingly two-tier economy, dragged down by a 2000-10 jobless decade, globalization, and a lack of real wage growth for a generation, was sunk by greedy big banks and Wall Street. They, abetted by blind regulatory oversight, created irresponsible investment schemes. When the fiscal tidal wave hit, American workers had exhausted their tools to maintain their standard of living—a second family income, second or third job, more hours worked, credit cards, a stock-market bubble before it burst, home refinancing, home-equity loans, student loans, and additional education. Most states, having used up many of their budget “gimmicks,” also fell into a huge new hole, and are still digging out. And here’s a little-noted statistic: According to the Wisconsin Department of Revenue, two-thirds of corporations in the state pay no taxes, and the share of corporate tax revenue funding state operations has fallen by half since 1981. Public sector defined benefit pension plans, a recent high-profile target for many critics, are not inherently—or specifically, in the case of Wisconsin—”the” problem. Such pension plans, both public and private, work just fine when governed by maths and not wishful thinking. But when pension funds either rely on unattainable investment assumptions and excessive disability or cost-of-living benefits, allow for spiking of salaries in the last one or two years of employment or double dipping; or when officials fail to make the required contributions on time, actuarial calculations turn the process into a fiscal Ponzi scheme. Ironically, Wisconsin’s retirement fund, according to the fedgazette, a publication of the Minneapolis Federal Reserve Bank, was praised for a series of responsible features in its pension design, leaving the program nearly 100 per cent funded with the average new worker’s pension at $1,900 a month. Although Gov. Walker casts the changes in collective bargaining in terms of fiscal responsibility, the exemption of police, firefighters, and other public-safety workers from these changes—and the demand that unions be re-certified every year or lose their legal standing—undermines his claims. Andy Stern is a senior fellow at the Georgetown Public Policy Institute and a former president of the Service International Employees Union. Finally, both Democratic and Republican governors, in response to this rocky fiscal environment, have to make tough choices. Whether you are a new Democratic governor like Andrew Cuomo in New York or John Hickenlooper in Colorado or a Republican like John Kasich in Ohio or Walker in Wisconsin, you are going to take action that makes school districts, cities, universities, and libraries, as well as teachers, police, librarians, and university students, extremely unhappy. So why has Wisconsin, with a better budget and pension picture than most states, and with workers prepared to make financial sacrifices, become the epicentre of a virulent attack on collective bargaining? Well, consider this: More than 15 other states are facing Republican initiatives to change their teacher, state employee, and local government bargaining laws, or private sector right-to-work laws. A mere coincidence? An accident of fate? No, this is not happening by chance, but, I believe, by the choice of Republican elected officials, motivated by their contributors and supporters, channeling Rahm’s “Every crisis is an opportunity” mantra. This also seems to be the “Rahm moment” for the GOP’s allies—the Koch brothers, the Club for Growth, FreedomWorks, Americans for Prosperity, the Chamber of Commerce, American Legislative Exchange Council, and the National Right to Work Committee—who have been waiting for the right opportunity to launch a frontal assault on workers’ rights. 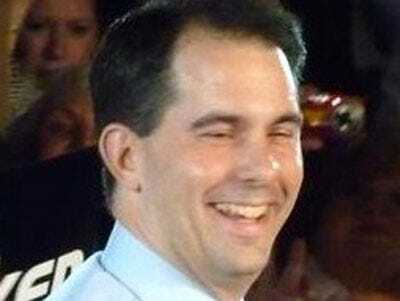 And in Wisconsin, with a willing governor, they found their beta test. Oddly, at a time when the Supreme Court in the Citizens United case disturbingly empowered corporations, we are in the process of disempowering people—by attempting to weaken their rights and the effectiveness of their union or association. Collective bargaining was a choice by our leaders to reduce the role of sweeping laws and regulation of the private sector. American business and political leaders wanted to let workers and their employers determine their own future and share in the fruits of success, not establish a more European social democracy. It was Wisconsin in 1959 that wisely extended those private-sector rights to firemen, teachers, nurses, police, and other public employees. This is not a simple Wisconsin issue; it is a 15-state campaign to weaken workers and their organisations’ rights. In all 15 states, it is being led by one party. Exempting police and firefighters—and requiring changes that undermine a union’s legal standing—are politically, not fiscally motivated. Wisconsin’s fiscal and pension issues are merely the crisis that provides conservatives with the opportunity for a good old-fashioned power grab, political payback, and a smokescreen for an agenda of disempowering people. The spirit of Rahm is alive and growing.